It was the loss of the ship Adventure in 1789 that encouraged people to look towards building a boat, purposely built for saving lives at sea. As the Adventure was a Newcastle ship it was not unnatural that the South Shields boat builders should be involved. An advertisement in the Newcastle Advertiser on 2nd May 1789 offered a ‘prize’ of two guineas for the best plan for a lifeboat…The boat should be capable of containing 24 persons and to go through heavy broken sea. Disappointingly the Gentlemen of the Law House only received two entrants to their requests, one from a Mr Woodhave and another from a South Shields boat builder Mr. Greathead. It would be hard to say who ‘invented’ the first lifeboat but it seems, without question, that Henry Greathead built the first. Lord of the manor Thomas Dundas was resident at Upleatham Hall and landlord to many of the fisher men and their families in Redcar. A ship owner himself he had seen one of his laden ships wrecked off the coast of Redcar earlier in the year and vowed to assist wherever he could. The Rev Williamson was Vicar of Guisborough and Upleatham so was also involved in the plight of the local fishermen and their safety at sea. Redcar’s new lifeboat arrived on 7th October 1802 and was the cause of much excitement in the village and was recorded in the Newcastle Courant with fullest details. Similar to Greathead’s first boat, she was delivered without name and commonly just referred to as the ‘Lifeboat’ and it was not until many years later, in fact 1838, when the Baron Dundas of Aske was bestowed with the title of the First Lord Zetland. It was this that prompted the people of Redcar to christen the lifeboat ‘Zetland’ in honour of their very generous benefactor. In 1864 and with the arrival of a replacement boat, the Zetland was destined to be broken up as was the normal procedure for boats unfit for purpose. Due to pressure from Henry Walker Yeoman, the Earl of Zetland’s brother in law, the Zetland was allowed to be retained by the local people. One of Lord Zetland’s friends who was staying at Upleatham wrote a poem regarding the boat retention his phrase ‘Thine age shall be respected, thy youth perchance restored’ was to become forever associated with the old boat. Much controversy followed as Henry Greathead’s plans were considered the winner with William Woodhave being offered one guinea for his troubles (which he declined to accept )… Doubt will always exist as to the true reasons why Greathead’s design should have been accepted when it seemed to incorporate some of the features of the original Woodhave design. From numberless versions as to the origin of the lifeboat, space will allow for a mere glance. In 1789, the inhabitants of South Shields had been spectators of many shocking disasters at the entrance of the Tyne. A committee was formed, and premiums offered for the best invention calculated to brave the dangers of the sea in storms. WILLIE WOODHAVE and HENRY GREATHEAD suggested various methods, but none of these was adopted in its entirety. It was resolved, however, to combine the different proposals, and GREATHEAD was nominated to build the first lifeboat. She was known as the “Original” – launched in 1790, was rent in twain on rocks in 1830. The “Tyne” was built in 1833, and her last achievement was on the 6th December, 1832, having rescued one thousand and twenty-three lives, during 50 years. At Her Majesty’s jubilee in 1887, £500 was raised to erect a memorial to Woodhave and Greathead, in the form of a square tower and steeple, fountain, medallion of Woodhave, model boat by Greathead in a storm, and a four-dial clock costing £90. On Monday, 7th, May, 1894, the sheltered platform for the “Tyne” was completed and she was elevated to her position as a devoted relic from the treacherous ocean. with the additional blessing of having saved upwards of four hundred lives. so far as appearances go, in being re-painted and fitted up for a visit to Huddersfield, on 23rd of June. On the 8th, March, 1804, “The Rose” struck on Redcar rocks. The “Zetland” could not approach the vessel, but 26 lives were saved by fishing cobles. March 25th, 1808, the “Caledonia,” Aberdeen, laden with granite, struck the Saltscar rocks. During the night only the helmsman was on deck. At the first crash he awoke the crew of 23. A signal of distress was fired, but not heard on shore. The captain refused to fire another gun; but the powder had become wet, and their efforts were in vain, and the vessel began to break up. Sixteen of the crew ventured in a boat and were lost. In the morning the “Zetland” heaved to the ship, and saved the remaining seven. The dead bodies of ten were picked up and taken to the Red Lion Hotel, and afterwards buried five in a row in one grave, at Marske. There are two headstones, Captain Booth, aged 50, another to Mr. Burnett, aged 18. Portions of the granite, with which the “Caledonia” was laden, were used in paving the footpaths in Moore Street, Redcar, and were only removed four years ago. Odd pieces are still to be found as relics of this catastrophe. Nov. 18th, 1809. – Four ships ashore in Tees Bay. “Zetland” saved two crews, numbering 10; the rest perished. Sept. 6th, 1826. – A large Greenland whaler named the “Esk,” was lost near Marske. Out of the crew of 29 only three were saved. Witnesses of the awful spectacle of poor humanity ever and anon cast ashore by the remorseless as waves, the harassing scenes of destruction on the sands for miles, was one which could never be effaced from memory. Dec. 9th, 1834. – The brig “Mowbray,” was driven ashore between Redcar and Coatham. The “Zetland” rescued 10 seamen, and returned to the shore. Whilst gazing at the distant vessel, the boatmen observed two boys lashed to the rigging who had been left behind. In the meantime the tide had receded, affording a better chance of reaching the “Mowbray,” though at imminent peril George Robinson, coxswain, launched a small boat, and alone succeeded in bringing the two boys to land. For this noble deed a subscription was entered upon at Stockton, and in May, 1835, a silver tankard was presented to Robinson, which is still an heirloom at Redcar. The memory of George Robinson as coxswain is still in good repute among the senior classes of fishermen, whom he frequently admonished when on a risky journey, thus – “Noo, lads! Ah know you’ll dee yer best. Don’t forget there’s twenty- three on us!” and away the sallied, brightening all eyes, and cheering those in despair. Robinson died in 1859, aged 63. On Christmas Day, 1836, according to his tombstone in Redcar Churchyard, William Guy, pilot, in his 41st year, was “plunged into eternity whilst engaged with others in a brave but fruitless attempt to render assistance to the crew of a Danish vessel off Redcar.” The name of the vessel was “Caroline,” with ten men on board. 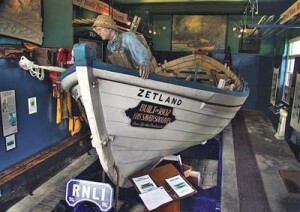 The “Zetland” was manned by 22, George Robinson, coxswain, two men to each oar. The boisterous ocean drove the “Caroline” and lifeboat hither and thither. The crew of the doomed vessel left in two boats, and one came within what Guy thought easy distance for hooking or casting a line. In the attempt he was washed overboard and lost to sight in a moment. The “Zetland” was smothered in the sea, ran several hundred yards invisible and ultimately washed ashore between Redcar and Coatham. Nineteen out of the twenty-two oars were dashed out of the men’s hands by the waves. William Guy was the only man lost from the “Zetland.” Seventeen days after, Guy’s body was picked up in the vicinity of Staithes and recognised by initials on his stockings and underclothing. Two of the heroic crew of the above mishap are still residing in Redcar, and familiarly known as Jacky Stonehouse aged 87, Thomas Boagey, retired captain, aged 73. Saturday, 13th Nov., 1841, was calm, lovely evening when the “Susanna,” collier brig, sailed from Middlesbrough, but during the night a terrific gale arose. On the following morning she was opposite the Coatham, at easy distance from the sand hills where the Convalescent Home now exists. The masts wriggled to and fro, the sails were in tatters, whilst the ill-found, rotten vessel plunged into the troughs of the sea, or was hoisted by the waves mountains high, in view of scores of anxious spectators. The “Zetland” hovered near to save the crew of 11, but was unable to render assistance. The “Susanna” was cast upon the sand bank and every soul perished. A dog belonging the vessel swam ashore, and was carefully nursed. On board the “Susanna” was a near relative of Capt. Thos Boagey, of Redcar. January 5th, 1857 – On this occasion great credit was due to the young men of Redcar, whose ages ranged from 17 to 21, in manning the “Zetland” lifeboat and two cobles, with Robert Shieldon as coxswain, to rescue the barque “EMMA,” off Redcar. When the “Zetland” was in easy distance from the ship the captain leaped into the lifeboat, but the crew refused to follow his example. Sufficient money was raised by subscriptions to present Shieldon with a gold watch, for his tact in saving nine lives. Willie Upton, now 76, followed Shieldon as cox. On the 10th, February, 1864, there occurred one of the most disastrous gales within recollection of the oldest seafaring community in Tees Bay. The brig “Roman Empress” was smashed to atoms, but the “Zetland” was lucky, in rescuing ten of the crew. On the 11th January, 1870, about 11.30 pm., the brig “Berdhinska,” of Whitby, whilst on voyage from Shields to the West Indies, with a cargo of coal, struck the West Scar Rocks. The weather at the time was hazy, and the captain took Hartlepool light for that at Seaham Harbour. Some of the fishermen went to her assistance, and thirteen of them agreed to get her off for £60. This they did on the next tide, with the help of a steam tug: and being very leaky, she was taken to Hartlepool. She had lost her rudder, and sustained much damage in consequence of rolling on the rocks. On December 9th, 1874, a couple of collisions occurred with Coatham Pier. The brig “Griffin,” of Southampton, bound for Sunderland with a crew of seven ran through the shore end of the pier. There were carried away about six lengths of wood work and iron fittings. After striking and clearing the pier, the “Griffin” drifted about 100 yards inshore, and became embedded in the sand nearly opposite Coatham Hotel, where portions of her hull still remain. The “Griffin” was laden with valuable oak. The crew were saved. The schooner “Carrymbus,” Dundee, five hands, all belonging to Arbroath, Boulogne to Shields, passed through the same pier, midway from the saloon to the north end, and carried away on her bulwarks an iron girder towards Warrenby, after losing her bowsprit rigging, &c. The crew were below at the time of the accident, and remained there till the tide receded, and then walked ashore. The desolate and shivered condition of Coatham Pier, divided into three sections, with long gaps between each, was appalling. The repairs were estimated to cost £1,500. The “Garibaldi” was also cast on the beach, facing Newcomen Terrace East. The crew were saved. There was thus four vessels ashore in one day, within a mile of each other. On October 11th, 1824, there were 37 vessels ashore within ashore within a range of six miles in Tees Bay. No doubt exists of the pluck and stamina of our sea-faring population, which are equal to all demands on their services, but, compared with the days of yore, the duties of lifeboat crews are now mere trifles. We have not been very successful in tracing reliable Merchant Shipping data, except the words “Brig,” “sloop,” &c, being the only guides, no numbers as to lives saved, or by what methods, leaving plenty of scope for “guessing” at the results. We have therefore omitted all reference to these disconnected outlines which commence with September 29th, 1825. Resort for the best information has been to Richmond, Wm. Hutton (1808), Orde’s Cleveland. Tweddel, scrap books, old newspapers, &c. &c. Personal inquiries for confirmation of facts, have also been made of those who have a life-long experience as toilers on the sea. In September, 1864, Lord Stratford de Redcliffe was on a visit at Upleatham Hall, and wrote the following poem. Lord Stratford was British Ambassador at Constantinople during the Crimean War. The Life-boat oh! The Lifeboat, we all have known so long. She housed the drowning mariner, and snatched him from the grave. All for the dear old life-boat uniting seem to plead. That made it, bird-like, flutter o’er waves deadly strife. The plea of sixty winters, old friend! can never fail. We’ll cheer the boat that’s foremost to save a sinking crew. The above proposal was made in February 1892, on the 31st of March, 2,300 projects were received, while 300 more were sent to late for consideration, a total of 2,500. The Judges were Rear-Admiral Seymour, Capt. Vivian, and Capt. Wyatt. Their award was published in the Daily Graphic on the 2nd June, 1892, and the £100 price was granted to Messrs. Noble and Thomson, Southampton, for their Boxer-Rocket Grapnel. The three judges conclude thus – “That the Mercantile Fleet numbers 15,000 vessels, manned by 204,000 valuable lives, to say nothing of the passengers annually carried, with a floating capital of property at sea, on any given day, in ships and their cargoes, said to be worth not less than 200 Millions Sterling, we recommend the adoption and perfection of the best means of saving the lives of our seamen when shipwrecked. Up to date, the Boxer-Rocket Grapnel reigns supreme. Noble’s Grapnel Whip Line can be Fixed and Fired from a ship’s Deck in less than Fifty Seconds, and communication effected from the stranded ship to shore in Eighty Seconds. In December last, a meeting of the member of this valuable institution was held in St. John Street, Adelphi, London, and Sir. E. Birkbeck, Bart, in the chair, when the second service clasp was voted to several gallant men for saving life during terrific storms of November, 1893. The thanks of the institution inscribed on vellum, were awarded to Richard Whittaker, a coastguard man, of Saltburn, for assisting a shipwrecked crew, and other persons. Rewards amounting to £3,383 were granted to crews of one hundred and ten lifeboats, for assembling on 133 occasions, during the month of December. Sums of money were also granted to shore boats, &c., for assisting at shipwrecks. Payments amounting to £7,500 were ordered to be discharged for three hundred and four lifeboats of the institution. From 18th Nov. to 21st Dec. the lifeboats were launched upwards of seventy times to aid distressed mariners, and were instrumental in saving about 800 lives. It is gratifying to learn of the success of this movement in large towns, for the benefit of the national lifeboats, of which the following are examples – Manchester, £2,800; Glasgow, £2,400; Bradford, £1,500; Southampton; £300; Dundee, £180; Barry; £140; New South State, £25; with a handsome subscription from Liverpool, ending May 30th, 1804. The total income derived from Lifeboat Exhibitions, is a benefit to the National Lifeboat Institution, 0f £18,000 per annum. Jan. 1804. During our many recent investigations amongst fishermen, &c., it has often asserted that there was” no other lifeboat but the Zetland hereabouts.” This is a local error. A lifeboat was established at Hartlepool on the above date (1804). About the same period, Mr. T. Backhouse, of Darlington, presented Seaton Carew with a lifeboat, and also built a shelter for its reception. Remember the day when by Allison on. How he prais’d your Appearance, Manoeuvres and Dress. But they’d better beware of the MOUTH OF THE TEES. April, 1804. Violent storms at sea, shipwrecks; sloop on the North Gare, Seaton, where she sank and all hands perished. June 12th, 1804. A smart action took place off Staithes, between the “Prs Augusta” cutter, and a French privateer if fourteen guns, when the latter departed, on approach of Capt. Thrush in two schooners, with a staff of the Sea Fencibles in an armed cutter. Jan. 30th, 1807. A sloop from Newcastle for Stockton was stranded on entering the Tees. Two men assisting to clear the ship of her effects were drowned by the flowing tide over the vessel, to much grog, having rendered them incapable. The “Zetland” saved eight of the crew. Nov. 23rd 1807. No less than seventeen ships were driven ashore within short distances of Tees Bay. April 17th, 1812. The “Ocean” of Aberdeen, laden with granite, struck on Redcar Rocks, and shortly broke in pieces. The crew was composed of seven men and boys, four of whom perished. Oct. 14th, 1814. The “Two Brothers”, of Whitby, with coals from Sunderland, wrecked on the South Gar, crew saved by Redcar lifeboat. October 24th, 1822. The “St. Martin’s” from Miramichia, with timber, and the “Hawk”, from Sunderland, lost on the North Gar, crew saved. Nov. 25th, 1825. The “Betsy and Ann” of Stockton ran ashore near Tees Mouth; vessel lost, the crew were saved. An Aberdeen vessel was wrecked in the same locality, with several crafts of smaller size, and the whole of the crews were lost. Dec. 12th, 1830. Tremendous gale, several vessels on shore at Seaton, amongst which were the “Newcastle,” (Capt. Crowther) a Newcastle-on-Tyne ship, with crew of nine, only two were saved. February 2nd, 1831. Twelve vessels were ashore in Tees Bay, and dozens of lives lost, with wreckage for miles. November 2nd, 1844. A Gotenberg vessel named “Celia,”, from Memel to Hull, was wrecked at Seaton, six out of a crew of twelve, were saved. Oct. 28th; 1852, – Twenty vessels were driven ashore; one was lost at Huntcliffe, and five off Seaton and Hartlepool. The crews numbered 60, only two persons were rescued. Jan. 3-5, 1857. – Upwards of 130 seamen perished, four vessels being lost at Hartlepool, with all hands. Jan. 4 to 10, 1853, – Eight laden vessels grounded on the bar at Hartlepool, and a dozen were driven on the beach at Tees Mouth. At the termination of the gale, 60 ships were wrecked between the Tees and Hartlepool, 40 at Sunderland, 34 at the Tyne Mouth, and 50 others in the neighbourhood. The ‘Maiden Bower’, a rock which for ages withstood raging storms, was levelled to the ground at Hartlepool. March 22, 1857. – On this day (Sunday), the “Margarethe,” of Hanover, was wrecked opposite Redcar. There were several pathetic incidents surrounding this catastrophe. Firstly, the master was washed overboard; secondly, two young boys were saved, but in a dying condition when landed. They were carried to the Lobster Hotel, Coatham, wrapped in blankets, well rubbed with warm flannels, and hot bottles applied to restore animation and vitality, internal stimulants to rouse action in their dead-alive unconsciousness, but all was to no avail. In Coatham Churchyard, a tombstone is erected to the memory of the two youths as follows – “Here rest the bodies of Wilhelm August Meenen, aged 14, and Staye Meenen, aged 11 who were shipwrecked in the Margarethe, of Carolinensigl, Hanover, on Sunday, March 22nd, 1857.” Three out of the crew of four were temporarily rescued by the “Zetland”, including the mate, who after a short period of careful nursing, was enabled to return to his own country. May 10, 1840. – The “Arcturus,” of Whitby, was wrecked at the Tees Mouth. In midst of a hurricane, the “Zetland and her crew rescued nineteen men. Dec. 21, 1845 – The “Commerce,” of Stockton, (Capt. Lister), in making for the Tees, became a total wreck. The “Zetland” was unable to overhaul the vessel, and all on board were lost, the mate’s body being washed ashore next day, terribly mangled by the rocks. Sept. 30, 1849 – The North-east Coast afflicted with severe storms of wind and rain. Sixteen vessels were ashore between Hartlepool and South Shields. Out of four wrecks in Tees Bay, the “Zetland” rescued two of the crews. Those of the “Albion,” of Newcastle, and the “John,” of Saltcoats were drowned. Jan. 3-5, 1857 – Four ships, bound for Hartlepool, ran ashore, and all hands lost. It was estimated, that upwards of 130 seamen perished in this gale, whilst incalculable commercial damage was sustained on land and sea. MONDAY, 6th, SEPTEMBER, 1858. – The Tees Bay Lifeboat and Shipwreck Society agreed to transfer their boats, stores &c., to the Royal National Lifeboat Institution, which included the “Zetland,” of Redcar. March 7, 1859. – The “Margaret,” of London, in ballast, struck on Redcar rocks, the crew were saved. Nov. 26, 1859. – The “Fortuna” was wrecked, but the “Zetland” saved eleven lives. March 28, 1860 – Heavy snowstorms, driving numbers of vessels to ruin at Redcar, Seaton, Hartlepool, &c. The “Cora Linn,” of Stockton, laden with guano, was lost with all on board in Tees Bay. The “Zetland” was on duty, but useless. Oct, 1860. – A most destructive gale, damaging houses, corn stacks, fruit trees, &c., at Middlesbro’, Stockton, Redcar, &c. A most exceptional event occurred, when the ebb tide on the Tees bar was remarkably low, so that in many places, the water was not more than a foot in depth. Dec, 16, 1860 – The brig “Eliza,” of Stockton, was wrecked on the North Gar, near Redcar. The crew were saved. Jan. 15th, 1861. – The “Theodore,” laden with coals and bricks, from Dieppe to Hartlepool, was lost near Skinningrove. Eight men took a boat, which was instantly swamped, the captain alone being saved, who had a lifebuoy on. Feb. 9, 1861. – The most fearful gale of any within recollection on the North-east coast. 60 to 70 vessels ashore near Hartlepool, upwards of 50 seamen lost between Hartlepool and Huntcliffe. At Whitby, the lifeboat was upset, and twelve lost their lives. Nov.1, 1861.- In a tempestuous sea, a brig was forced out of Hartlepool harbour, driven across to Redcar, and stranded, the new pier at Hartlepool being damaged. Feb. 11, 1864. – The “Zetland” saved 10 lives from the “Roman Empress,” at Redcar. Feb. 17, 1864. – The “Zetland” rescued seven of the crew “Brothers,” at Redcar. Feb. 13, 1862. – The brig “Sceptre,” of Middlesbrough, bound for London, with coal, whilst lying at anchor, near Lower Hope Point, was run into by “S.S. Scotia.” The Sceptre immediately sank, and three of the crew, who were asleep in the forecastle, were drowned, the master, and other five of the crew, were saved. Oct. 20-21, 1862. – Great losses of ship and lives during these two days, on the west and North East coast. There were upwards of one hundred casualties posted at Lloyds in three days. Feb. 20-21, 1865. – Severe weather at sea for several days. A fishing smack at Staithes, ran inshore opposite Seaton and the crew of nine were lost. The Hartlepool lifeboat was to late to render assistance,. A handsome subscription was raised for the bereaved families at Staithes. Nov. 16, 1865. – A Margate vessel, bound for Hartlepool, was wrecked on Saltburn rocks. On the following morning, a Scarborough brig was wrecked of the same rocks. Both crews were saved. Dec. 16, 1865. – The schooner “Helen,” from Hartlepool to Aberdeen, was lost in a terrific storm. The master fell overboard the preceding day and was drowned. The mate an apprentice only were left on the vessel; they launched the ship’s boat, and after being exposed for twenty four hours to the pitiless waves, were picked up by a Welsh schooner, and landed at Peterhead, Scotland. March 21, 1866. – The sloop “Gipsy” of Wisbeach struck the Saltscar Rocks, Redcar, about 2 a.m. and became a total wreck. The master, his wife, and two men, were saved by the Crossley lifeboat. July. 31, 1866.– During a heavy gale the “Ostrich,” of North Shields, soon after leaving the Tyne, ran into Manhaven, on the rocks near Marsden, when ten of the crew, including the captain, were lost, and only two were saved. Dec. 8, 1866. – The schooner “Wrecker,” of Newcastle, on leaving the Tyne, became disabled when near the North Gare, and became a wreck, neither lifeboats nor steamers could render any assistance to the ship, but a man named George Cowell, ventured off in a small boat, with the object of relieving the crew. Unfortunately the boat capsized, and the hero was drowned. The brave fellow did not succeed in his intentions like George Robinson the Redcar pilot and coxswain, who, on Dec. 9th, 1834, saved two boys, left by the “Zetland,” from the shop Mowbray. But her Deeds Live in Hearts that loved her well, and they grace Britannia’s story. The following list is from the authorised version of the National Lifeboat Institution, in the boathouse of the Brothers, Redcar. The Crossley’s was then transferred to Middlesbro. Nothing is further known concerning the Burton-on-Trent, but the conclusion is, that she was condemned as useless. June, 23rd, 1892. Wild Rose – Assisted. Nov. 18th, 1883. Crew of brigantine “Harriet,” was rescued by the Rocket Brigade and Volunteers. The vessel became a total wreck, part of which is still on the beach. The Bell Buoy, with compressed gas burning night and day, was lifted from its anchorage on the East Scar rocks, in the storm commencing on the 18th day of November last, and another was re-fixed in the same place, on the 30th December, 1893. On the 23rd of May last there arrived a new carriage for the Redcar Lifeboat Brothers. On the following day, the old one was despatched elsewhere, and the new comer tested, along with the lifeboat. The last invention consists of four wheels, the two larger being six feet high, which are surrounded with seven jointed sand clams of iron, 14 inches wide, or double the width of the wood wheels below the sand plates. The two small wheels are 47 inches high, without clams, and 6 inches wide on the rims. Although the clams create a loud noise in turning round the large wheels, practical men declare in favour of the method, as being much easier to convey the life boat over the sand, even to the edge of the water. The money collected by the citizens of Glasgow, at their Lifeboat Demonstration last year, inclusive of benefactions (£3,500), has been spent upon an hydraulic steam lifeboat, and was exhibited on Saturday last at Glasgow, with great favour. The procession and enthusiasm of immense crowds exceeded former occasions. Encouraged by the success which attended the Lifeboat Saturday Demonstration in Bradford last year, it has been decided to have one annually. At a meeting of those interested in the movement held on Friday, the date fixed for this summer was August 25th.